Facts about Blue Poison Dart Frog, "Scientific name for Blue Poison Dart Frog is Dendrobates azureus". Blue poison dart frog is commonly found in forests surrounded by the Sipaliwini savannah located in the southern part of Suriname. Blue Poison Dart Frog is known for its azure blue color which makes it outstanding. Dendrobates azureus, a name derived from its genus Dendrobates. Locally, it comes in various names depending on the language and culture of the surrounding communities. For instance the Tiriyo Indians refer to it as Okopipi. Blue Poison Dart Frogs are Known for its blue skin that darkens around its stomach and limbs, the Poison Arrow Frog as it is commonly called is medium sized in weight measuring approximately 8 grams. In length, a majority of frogs in this breed measure between 1 1/8 to 1 3/4 inches (3.0 and 4.5 cm) with the females being larger in size by about 1/2 inches (0.5 cm). The Blue Poison Dart Frog has poisonous glands containing alkaloids around its skin that it uses to paralyze and kill its potential predators. Each foot has four toes featuring flattened tips and suction cup pads for gripping. In the wild the Blue Poison Dart Frogs live up to 7 years, while in captivity their lifespan lengthens to ten years. 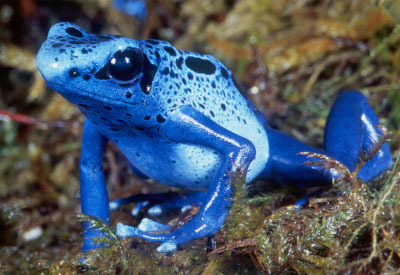 The blue poison frogs spend most of their time in the mainland but closer to water sources. It is common to see them hoping and leaping during daylight as this is when they are most active. To attract mates, the male Blue Poison Dart Frogs call and the females on hearing this call start their frantic search for the males. It is common to see the females chasing and wrestling over males with the winner taking it all. The female Blue Poison Dart Frogis then led by the male to a calm place near a water source where it lays eggs and the male fertilizes them externally by spreading covering them with sperm. The fertilized eggs take around 14 to 18 days to hatch and are aggressively protected by the male Blue Poison Dart Frogs. About 5 to 10 tadpoles result from every mating with each attaining maturity in 10 to 12 weeks. The primary source of food for the Blue Poison Dart Frogs is insects. They feed on ants, caterpillars, flies and occasionally on arthropods such as spiders. In captivity, their diet slightly changes and they feed mostly on pinhead crickets, spring tails, fruit flies and rice flour beetle larvae. This affects their lifespan and makes them lose their toxicity.